Well….here we are, my friends…less than two weeks until Christmas! Are you finding yourself overwhelmed, with too much on to do on your plate right now? Too much decorating to do. Too much wrapping to do. Too much cooking to do. Let me see if I can help you out a bit with a few fast and easy ways to add Christmas around your house! 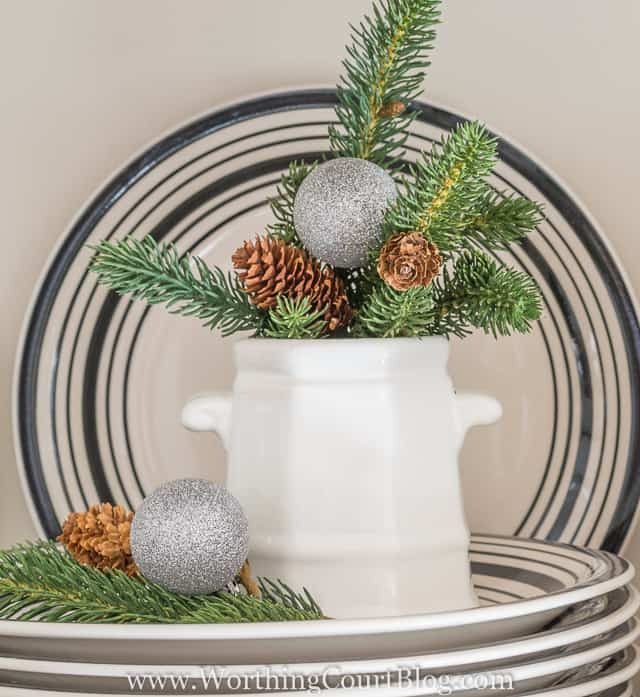 Fill a sugar bowl with faux or real greenery, a pinecone or two and an ornament. Christmas in less than 5 minutes! This little arrangement could even last you through the winter. Fill a box with assorted Christmas plates, a special cookbook or two and a large ornament. Add a bow made with festive ribbon for the finishing touch. 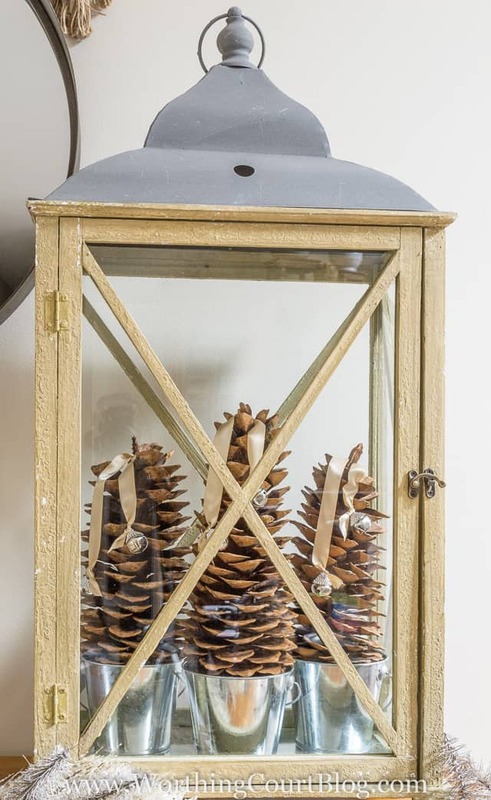 Add some tall pinecones to containers, tie a ribbon around the top with a small jingle bell or ornament attached. Place them into a lantern and people will be wowed by what you did! Remove the ribbons and bells after Christmas and you have yet another vignette to carry you through the winter. Christmas ornaments aren’t just for trees. They make great props! 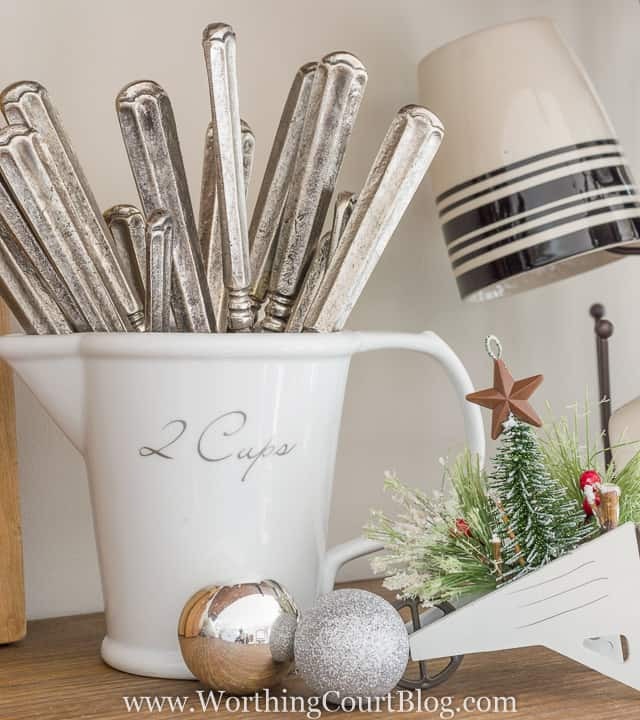 Simply place a special ornament along with a couple of ordinary Christmas balls among your everyday items. Another vignette in less than 5 minutes! 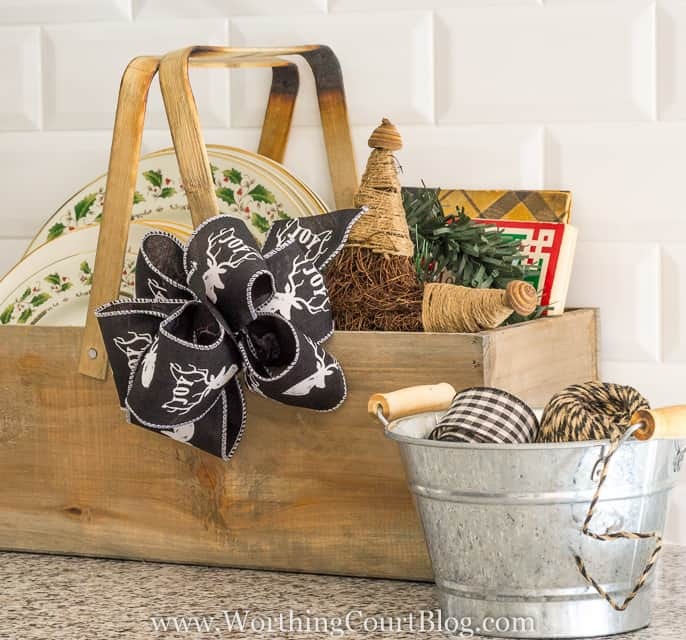 For a fast centerpiece, place a scarf in the bottom of a basket. Add a lantern with a candle, an inexpensive faux tree and one other large item (in my case I added a silver squirrel nutcracker). 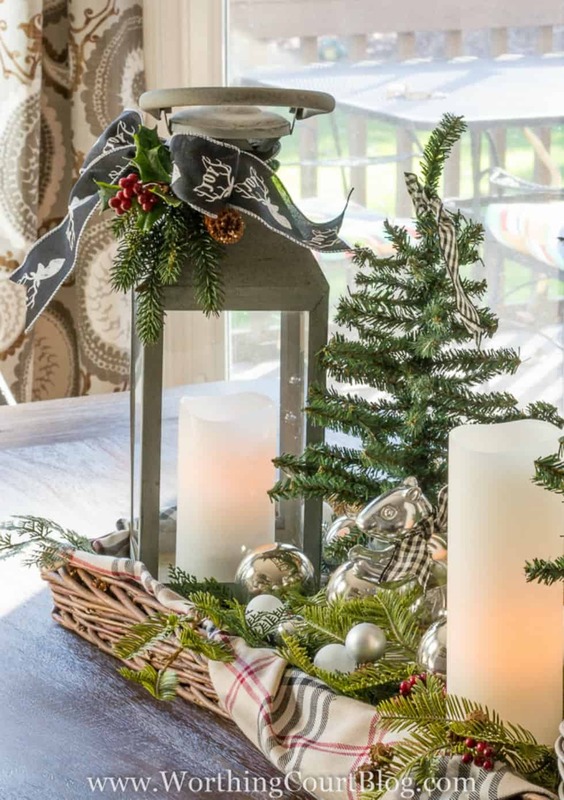 Fill in the empty spots with faux greenery topped with small Christmas balls. Fast, easy and it’ll look like a million bucks! Fill a large basket with assorted greenery, a few sparkly picks, a few shiny ornaments and sticks from your own yard! Wrapped Christmas presents can be a decoration too! Just be sure to use wrapping paper, ribbons and tags that all work well together. Then group them in an attractive way instead of just throwing them under the tree. Thank you for stopping by for a visit today! I hope you were able to find some inspiration for quickly decorating your own home for Christmas. Great ideas. I especially liked the one on the table with the bread bowl and greenery. I pinned it so I don’t lose the idea. Thanks for sharing. I just love all of your quick decorating ideas. I find myself decorating & moving things until the final day. Just love this time of year. Happy Holidays! Such pretty and easy ideas! These are definitely serving as my primary inspiration as I put the final touches on my Christmas decorating! So many adorable and current ideas! Thank you for taking your time to share with us! Great ideas! I especially like the Fast Centerpiece-I’m off to look for a scarf! Loving all your last minute ideas…..Helps to make the holidays much more fun! Thank you! Love all these great ideas!!! thanks for sharing!!! We can always use a few more Christmas touches!! Wow, super quick ideas that I really needed…we have a big party this Saturday and there were a couple of lacking spots to fill with Christmas cheer….thank you so much and MERRY CHRISTMAS to you and all! Absolutely beautiful. I just love the tray idea. Thanks for sharing all your wonderful ideas. Merry Christmas!! Great job very welcoming and comfortable. Those were all really good and simple ideas. Thanks so much! I love your decorating ideas! I may even “steal” a few for myself! I love these quick decorating ideas. Especially, the arrangement of the gifts. Thanks for sharing on Sunday’s Best. Love the big basket with the greens. Such a natural touch and elegant. Oh my goodness! The basket + scarf + lantern is the BEST idea. I’m setting our Christmas table today and can’t wait to use that idea. Off to find a scarf! 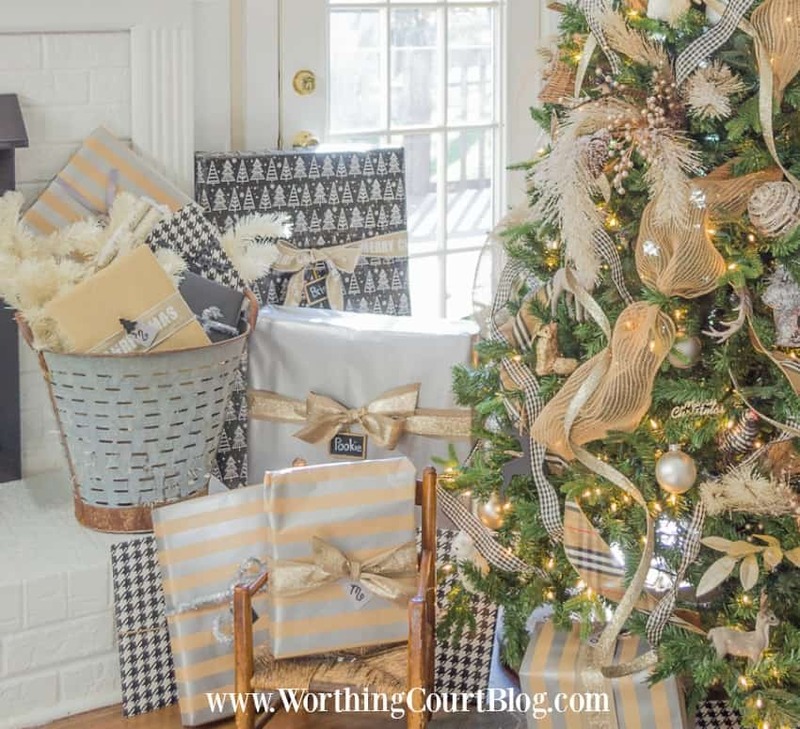 That table is darling and I absolutely love boxwood wreaths. So pretty & classic and can be done so many ways. I am starting slow on Christmas decorating and it’s pretty minimal so far, but I’m going to try to do a little more over the next couple weeks. I did find a boxwood wreath at Trader Joe’s that looks great in the kitchen. 🙂 xo! 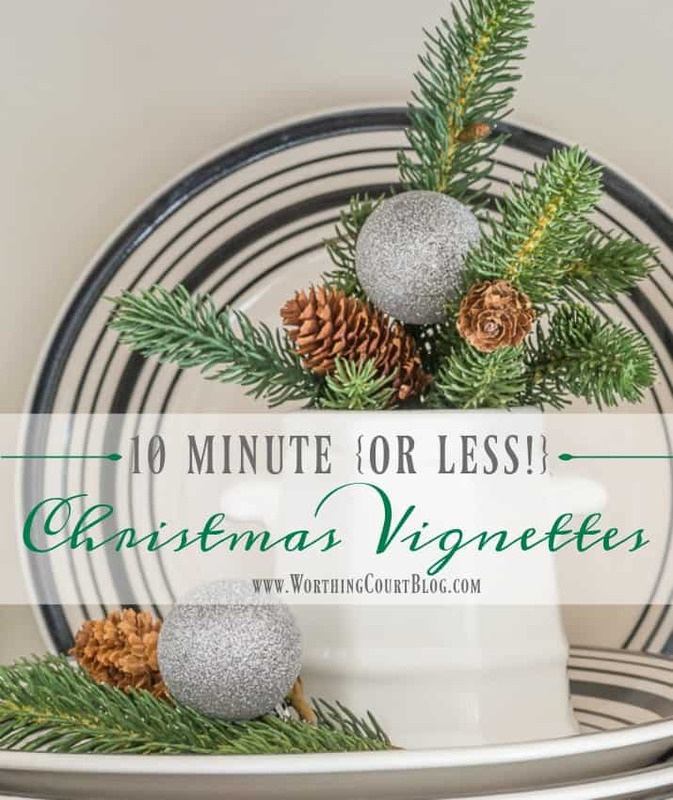 What wonderful Christmas vignette ideas. Love them all. Last minute, sparkly and almost instant. Who could ask for more? Great tips! I love how you used all of the lanterns in your decorating. Thank you! Love these ideas! 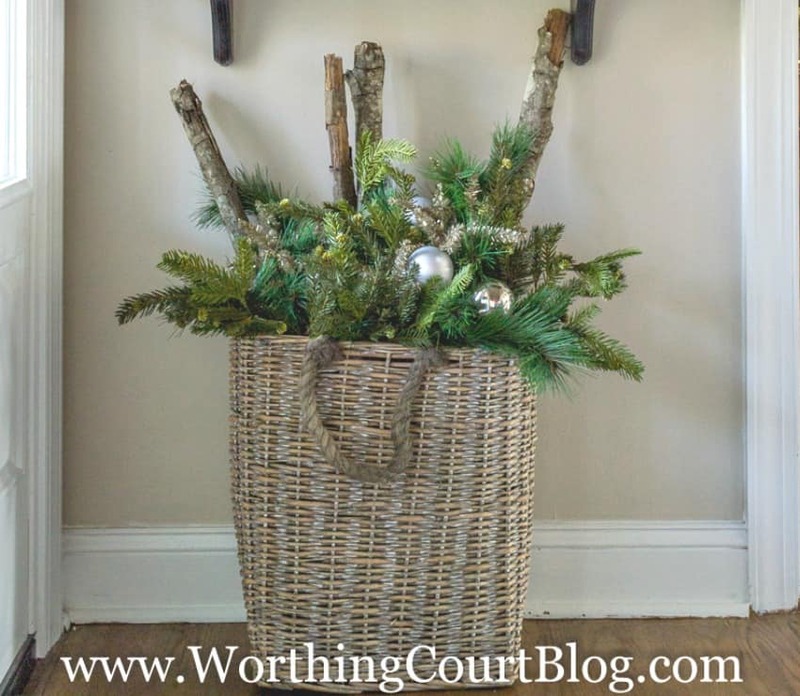 I love the greenery and sticks in a basket idea! I am planning on doing that with my leftover Christmas tree boughs for a winter front porch decoration. Thanks for linking up with us at Share the Wealth Sunday! You are always such an inspiration!! I’m starting to think about how I want to decorate for Christmas/winter. I try to have some of both out so once the Christmas items are put away, I still have decorating pretty much done. I like some of your very quick and simple ideas.